Shalwar kameez, also spelled salwar kameez or shalwar qameez, is a traditional outfit originating in South and Central Asia and is a generic term used to describe different styles of dress. 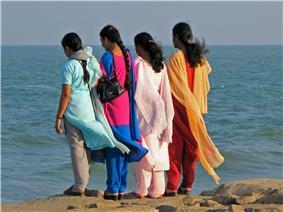 The shalwar kameez can be worn by both men and women, although styles differ by gender. The shalwar and the kameez are two garments which have been combined to form the shalwar kameez outfit. Schoolgirls in Shalwar Kameez, Abbotabad Pakistan - UK International Development The shalwars are the white trousers; the kameez the blue shirt. The man in the background on the right is also wearing a shalwar kameez. 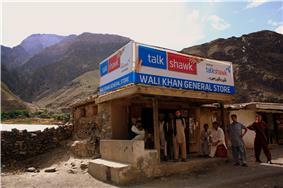 Men dressed in Shalwar kameez on the road to Kalash valleys, Chitral, Pakistan. 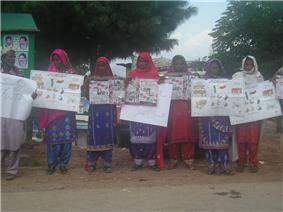 Women in Sindh, Pakistan, dressed in ornate shalwars, in a picket line. 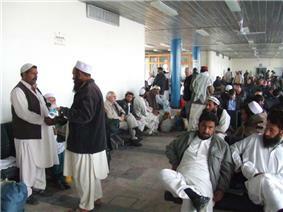 Men wearing Perahan tunban, form of shalwar kameez at Kabul Airport in Afghanistan. The shalwar are loose pajama-like trousers. The legs are wide at the top, and narrow at the ankle. The kameez is a long shirt or tunic, often seen with a Western-style collar; however, for female apparel, the term is now loosely applied to collarless or mandarin-collared kurtas. 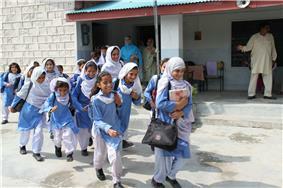 The kameez might be worn with pajamis as well, either for fashion or comfort. Some kameez styles have side seams (known as the chaak), left open below the waist-line, giving the wearer greater freedom of movement. The kameez is usually seen straight and flat, but there are a variety of styles. Modern kameez styles are more likely to have European-inspired set-in sleeves. If the tailor's taste or skill are displayed, it will be seen in the shape of the neckline and the decoration of the kameez. Traditionally, the female kameez was a modest article of clothing, but modern versions of the female kameez can be much less modest than traditional versions. The kameez may be cut with a deep neckline, sewn in diaphanous fabrics, or styled in cap-sleeve or sleeveless designs. The shalwar kameez is often known as a "Punjabi suit" in Britain, where South Asian women from the Punjab region have brought the dress to the mainstream, and even high-fashion, appeal. 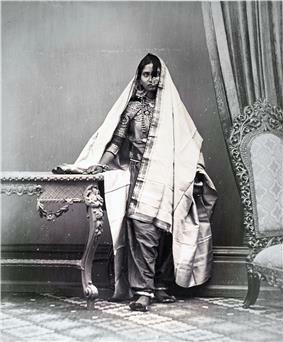 In India, the garment was originally popular in the North as a convenient and modest alternative to a sari. Owing to its traditionally generous cut, the kameez also fits well on most people regardless of body shape, it has become popular across the sub-continent. The pants, or salvar, are known as salwar in Bengali, salvar in Punjabi: ਸਲਵਾਰ ਕਮੀਜ, salvaar or shalvaar શલવાર કમીઝ in Gujarati, salvaar or shalvar शलवार क़मीज़ in Hindi, and shalvar in Urdu: شلوار قمیض‎. Garments cut like the kameez are known in many cultures. According to Dorothy Burnham, of the Royal Ontario Museum, the "seamless shirt," woven in one piece on warp-weighted looms, was superseded in early Roman times by cloth woven on vertical looms and carefully pieced so as not to waste any cloth. 10th century cotton shirts recovered from the Egyptian desert are cut much like the kameez or the contemporary Egyptian jellabah or galabia. Transliterations starting from Punjabi often render the sibilant sound at the start of salwar/shalwar as an "s". Transliterations starting from Urdu, Lahnda, Persian, Pashto, Turkish languages use "sh". Both spellings are found in common English usage. The shalwar spelling seems to be most common in Canada and the United Kingdom, and is the preferred spelling in the Oxford English Dictionary. Salwar is the spelling most commonly used in India. The word kameez is also spelled with a Q, as in Qameez. 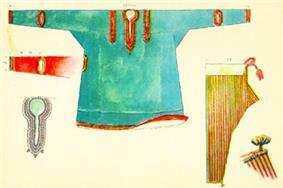 Ancient form of Shalwar Kameez worn during Gupta Empire. Portrait of a Hindu girl from Karachi, Sind, in narrow Sindhi suthan and cholo. c. 1870. Oriental and India Office Collection, British Library. 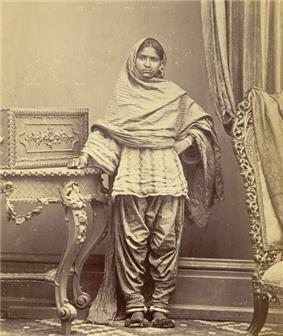 Portrait of a Muslim girl from Karachi, Sindh, in a suthan and blouse. c. 1870. Oriental and India Office Collection, British Library. 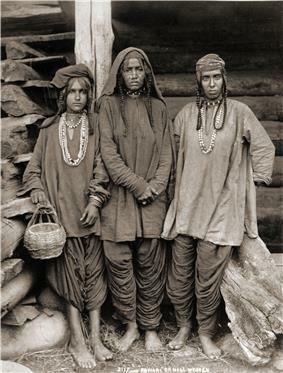 Hill women, Kashmir, in suthan-kameez. c. 1890. The following can be mentioned amongst some of the forms of shalwar kameez namely: Khet partug, Perahan tunban, churidar kameez, Dogri suthan and kurta, Sindhi suthan and cholo and the Anarkali Salwar Suit. 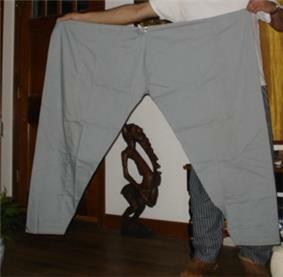 A man's shalwar held up to display amount of material needed. 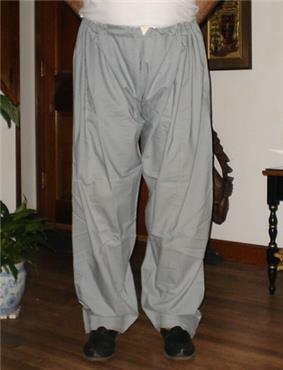 Shalwar (with Kabuli sandals) as worn in South and Central Asia. Walton-Roberts, Margaret; Pratt, Geraldine (2005), "Mobile Modernities: One South Asian Family Negotiates Immigration, Gender and Class in Canada", Gender, Place and Culture 12 (2): 173–195, .